Whether you are having a civil or religious wedding ceremony, a string quartet is the perfect accompaniment for the arrival of your guests, the entrance of the bride, the signing of the register, and the exit of the bride and groom. 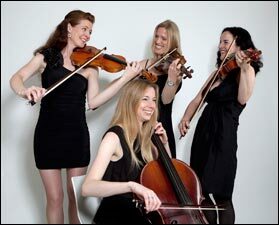 The Barber String Quartet can also add a stylish ambience to your drinks reception and wedding breakfast. You can tailor the occasion with the quartet playing for as much or as little of the day as you choose. You can be as traditional or as wild as you like with your choice of music – the day is yours! We have an extensive repertoire for you to choose from and we will endeavour to obtain music for any particular special requests. You are welcome to have as much or as little input as you like in selecting the music for the day. The Barber String Quartet have regular contact with you in the lead-up to the day and ascertain exactly what it is you would like from us. We arrive in plenty of time on the day and familiarise ourselves with the venue and liaise with the relevant staff. The Barber String Quartet’s extensive experience enables a relaxed and smooth running service. I just wanted to say how very lovely the music was that you and the string quartet provided at our wedding. So many guests were praising how moving all the songs were and what a special touch it added to the day. Thank you again ever so much for adding something very special to our day. Also, I really appreciated your calming words leading up to the wedding. I will certainly be recommending your services to anyone who gets married in London in the future.